Daily Icelandic Icelandic vocabulary seen in daily life in Iceland. From packaging, conversations, newspapers, et cetera. Eth & Thorn Photo Archive My own photos from Iceland, archived. I Heart Reykjavík “One Person’s Guide to Reykjavík” — Local Auður Ösp gets to know her hometown, and shares her insights. Iceland Eyes Blog about all things Icelandic, maintained by Maria, an Icelander who grew up in California and now lives in Reykjavík. Wonderful photographs, both by Maria and many guest photogs as well. Iceland in Pictures Tumblr blog “about Iceland, the Icelandic language and Icelanders” maintained by a part-time mountain guide. Icelandic Cinema Online Online rental service for Icelandic films, documentaries, and music videos, updated often. 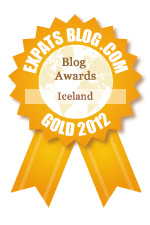 The Iceland Weather Report Blog about Icelandic culture and politics, maintained by Alda Sigmundsdóttir. adventures in childcare articles of interest Artworks Bandaríkin camping celebrations Christmas conversations crash&burn Crymogea Culture Shock Dance daytrips Departure el Film food from the mouths of babes Frábært! Getting Awesome Getting Settled goats Grammar is Hard Haskoli history holidays Icelandic 101 Icelandic translators language barriers libraries literature Little Free Library Reykjavík Loving the Volcano museums Music New Finds New York Observations on the town outings portraits and profiles publications quotable Reykjavik Grapevine South Iceland summer Thank You Iceland The Island Review translations Untranslated Vestmannaeyjar video visitors Vocab Wacky Pronunciation Weather! websites West Iceland Westman Islands What time is it? Word of the Day Áfram með smjörið Þetta Réddast. áfram!